In Stowe, Vermont lies a covered bridge they call “Emily’s Bridge.” There are several versions of Emily’s sad tale. Some versions say that Emily and her boyfriend were meeting at the bridge to elope, since her parents did not approve. He never came, and she hung herself from a rafter. Another version says Emily was left at the wedding alter. She hopped on a carriage to find her love. When she reached the bridge, one of the horses was startled and she died in an accident. Some versions say she was killed by runaway horses on the way to her wedding. Whatever way you put it: Emily reached a tragic fate. Visitors to the bridge have reported scratch marks on their cars and bodies, and strange noises (footsteps, ropes tightening, girl screaming). If you park your car on the bridge you might hear banging on the car or her body’s feet dragging on the car’s roof. The Castillo de San Marcos in St. Augustine, Florida is the oldest masonry fort in the United States. The site itself is dripping with paranormal activity, but today we focus on an affair that led to murder. In 1784, Colonel Garcia Marti brought his young wife, Dolores to the fort. He wasn’t the most devoted husband and often ignored his wife, thus she found other ways to spend her time. She began an affair with her husband’s assistant, Captain Manuel Abela. Dolores wore a very unique perfume, which Garcia smelled on Manuel one day. Shortly after, Dolores and Manuel went missing. Garcia told everyone that Dolores had returned to Spain and that Manuel had a special assignment in Cuba. About 50 years or so later, a hidden room was found in a dungeon behind a brick wall. The remains of a woman and man were found (some versions say chained to the wall, some say in a pile of ashes). Sightings of a woman with a white dress have been reported on the site. Could it be Delores? Minnie Quay was the 15-year-old daughter of James and Maryann Quay. They lived in Forester, Michigan, so they often saw boats coming and out of town. Minnie fell in love with a sailor (not much is known about him) and her parents disapproved of this crush. One day, word came to town that his boat sank. Minnie was quite distraught, especially since her parents had forbidden her to say good-bye when he last left. Some time after, she was babysitting her infant brother for her parents. She left her house and walked towards the waterfront. People near the town inn, The Tanner House, waved as she walked by. Suddenly, their friendly faces turned to faces of horror as she walked into Lake Huron. Legend says she still walks the beach, waiting for her sailor to return. More frightening versions say she lures young girls towards the water, and towards their deaths. Jesse Strang deserted his wife and children and began a new life in Albany, New York. He lived under a new name, Joseph Orton, and began working at the Van Rensselaers’ residence at Cherry Hill. He caught the eye of the affluent Elsie Van Rensselaer, a married woman. Jesse and Elsie decided their love could really flourish without Elsie’s husband, John Whipple, around. Members of the household testified that they had heard Strang spread the stories of prowlers out to kill Whipple. The merchants who sold him the rifle and the arsenic testified as did hotel keepers who had seen Strang and Elsie together. But it was Strang’s confessions, admitted over the objection of the defense, which sealed his fate. The jury deliberated for fifteen minutes before returning a verdict of guilty. Verdicts: Jesse Strang – Guilty of first degree murder / Elsie Whipple – Not guilty. There is a ghost who dwells on the bottom floor of Cherry Hill and there is suspicion that it is the slain Mr. Whipple. 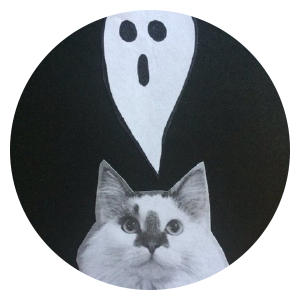 The ghost is not hostile and does not seem to mind the company in the old mansion, but those who have encountered him do say they sense an anger surrounding the spirit. Jesse Strang’s ghost can be seen around the Eagle Street ravine, where the gallows stood. He wears a robe and a hat trimmed with black, the same clothes he wore during the execution. There have never been reports of Mrs. Whipple’s spirit in or around the home. Imagine repeatedly running into both your exes in the afterlife. That’s pretty tragic. As we can see, tragic love often ends with lingering ghosts. There is even a type of ghost, the White Lady, that is often attached to a story of betrayal by a lover. The White Lady appears in folklore all over the world (to name a few: the United States, Czech Republic, Germany, Brazil). Even if you don’t believe in ghosts, you can acknowledge the universal power of tragic love in storytelling, and what better metaphor for heartbreak than a ghost. Thank you! This is the stuff of Twue wuv.